If you're looking for a Caribbean sailing or cruise vacation, Villa Casuarina can't be bettered. The villa is situated at Egmont Harbour, a pretty seculded inlet which provides a safe harbour for boats. The bay is an excellent place to fish (catch your own lunch of tasty red snapper!) or to go swimming and snorkelling. Just a couple of minutes walk away is the Marina and resort Le Phare Bleu with two restaurants, minimarket, and a lively bar which is a great place for a sundowner cocktail. There's live music most weekends and plenty of events going on throughout the year. The villa is 15-20 minutes from the Airport, and the town of St Georges is about 15 minutes drive, with the beaches of the south and east of the island just a short drive away. 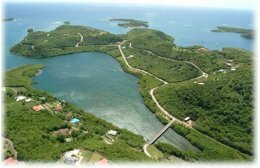 The villa is far enough away to be quiet and secluded, but close enough to enjoy the beaches and facilities of the South of Grenada.